Type: Lithium Manganese Dioxide. Voltage: 3.0V. Capacity: 210 mAh. Length of Flex: 70 mm. Height: 3.2 mm. Diameter: 20 mm. Price: £9.99 each. (£9.50 if you buy two or more). Postage and packing included. Functional replacement for: CMOS battery for Acer Aspire 6920g, Acer Aspire 8930g, Acer Aspire6935g and others. Compatible Models: Acer Aspire 6920g, Acer Aspire 8930g, Acer Aspire6935g and more. 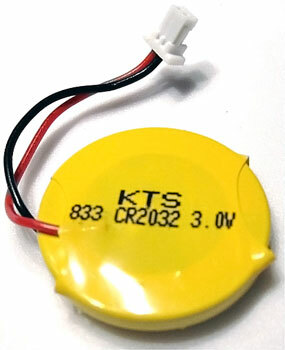 This small battery is commonly used in many CMOS battery for Acer Aspire 6920g, Acer Aspire 8930g, Acer Aspire6935g series laptop computers. Also fits a number of Dell machines such as the Dell Inspiron 14, replacing the battery with a part number of 23.21212.031. Our battery is a guaranteed replacement for the CMOS battery mentioned. This battery can be used in many Acer Aspire Series laptop computers which use a 3.0 Volt clock battery. * Actual manufacturer may vary depending upon availability. Length of flex greater than illustrated.